In a recent statement, Israeli Prime Minister Benjamin Netanyahu told reporters that “he sees no evidence of any impact of sanctions on Iran’s calculations about its controversial nuclear program.” However, Israel’s Ambassador to United Nations (UN) has told the reporters that the sanctions have a good shot at changing Iran’s behavior by stating “I think the international community at this stage has really moved forward and have made at least clear to Tehran that there is a certain price tag for continuing [their nuclear program]." These diverging statements might be attributable to different interpretations of the goals of the sanctions themselves or due to differences in the assessment criteria used to measure the sanctions’ success or failure. In short, the efficiency of sanctions may be interpreted differently by different parties. One thing that is not in question however is that sanctions are increasingly used as a policy tool for political intervention. Iran is a member of Organization of the Petroleum Exporting Countries (OPEC) and it has the fourth largest proven oil reserves and second largest natural gas reserves in the world. The 2011 CIA World Fact Book estimates Iran’s GDP purchasing power parity is $928.9 billion and ranks 17th in the world out of 226 countries but the economy has been subject to several social and economic shocks including political and regime changes, oil crises and most importantly almost two decades of economic sanctions. Its economy has been affected by economic sanctions and most importantly international energy companies have pulled out and halted their investments in upstream projects. A July 2011 IMF estimate suggested that Iran’s export of oil and gas reached $100 billion and represents 78-85% of total exports. As a proportion of the economy, oil and gas exports are about 21% of the gross domestic product and much lower than the ratio of oil: GDP of the Gulf Arab oil exporters (30-50%). UN authorized and US led sanctions have recently gained greater support from the EU. Since the EU agreed to halt oil imports from Iran by 1 July 2012, Iran in return has already largely stopped exporting oil to the EU because of increased tensions. Other oil consumers such as Japan, South Korea and Turkey have or may reduce their imports from Iran, however, Iran’s other trading partners, China and India, who currently consume 34% of its total exports have signaled that they will not cut back (at least significantly) and these countries may end up buying most of oil the destined to EU. One analyst has suggested that Iran may be forced to make a price discount of 10%-15% in order to find buyers under present sanctions. This may result a $15-20 billion reduction in revenue to the Iranian state. However this reduction has already been mitigated by a 15% increase in oil prices. Iran’s economy is marked by an inefficient state sector and statist policies that provide for the majority of government revenue. Private sector activity is typically limited to small-scale workshops, farming, and services. In 2011 the IMF suggested that Iran has a relatively well-diversified economy with a sizable industrial base, but large scale subsidies and inefficiencies have limited Iran’s ability to further develop its non-oil economy. 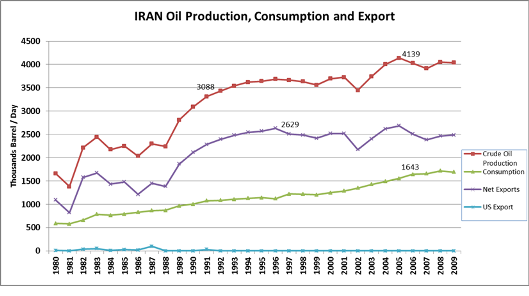 Iran’s growth in productivity has been low, and its energy-intensiveness has increased in recent years. Despite some recent improvements, Iran only ranked 129 out of 183 in the ease of doing business in 2010. Medium term risks to the economy include an acceleration of inflation if macroeconomic policies are too accommodative, an increase at least temporarily in unemployment during the restructuring of the corporate sector and a slowdown in the progress of reforms. Unemployment remains high at approximately 14.5% (2010) and is particularly prevalent among youth (at about 25%). In addition, the sanctions directly impede (purposely) Iranian trade and that if this continues they might actually halt Iran’s oil exports. Local exchange bureaus are being increasingly used as the sanctions impact on the Iran’s international banking system. The EU followed by UAE and China are Iran’s main trading partners followed by India, Japan, Turkey and South Korea, but the biggest blow has recently come from EU sanctions extending to SWIFT (Society for Worldwide Interbank Financial Telecommunications) transactions. This entity provides the technical platform for the exchange of financial information amongst banks and major Iranian banks are beginning to experience significant difficulties in conducting everyday businesses with their foreign counterparts when dealing with oil transactions. The Iranian constitution doesn’t allow foreign or private ownership of natural resources. The state-owned National Iranian Oil Company (NIOC) controls the production and export of oil. Iran needs more security for its oil either in the form of increased demand from some of its current customers or new markets. US Secretary of State Clinton recognized the importance of reducing oil imports during a period of high energy demand yet Japan, for one, has reduced its imports by between 15% to 22%. The Obama administration has exempted 10 European countries and Japan from US economic sanctions since they have significantly reduced oil imports from Iran. The UAE plays an important role in Iran since it is its second biggest trade partner and houses Iranian Revolutionary Guard Corps owned companies. Although most of these Iranian companies have been closed and those illegally trading with Iran were shut down, some have simply found new ways to circumvent the sanctions and provide shipments unhindered to Pakistan, India and China. The sanctions will have the greatest impact on countries that have large trade volumes with the US and purchase significant oil volumes from Iran especially China, Japan, South Korea and Turkey. Although India has supported the four UNSCRs passed since 2006 to pressure Iran to give up its nuclear ambitions, it has stated that it will continue to buy Iranian oil. South Korea will seek an exemption while Turkey has also announced its intention to request a waiver. Smuggling and the use of third parties to circumvent sanctions are expected to be significantly increased as the rope tightens. How long can Iran tolerate sanctions? 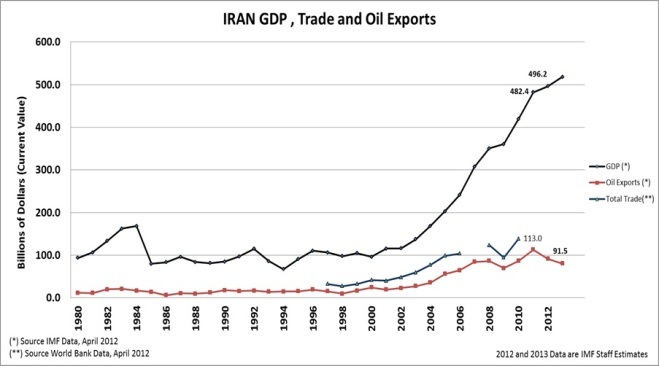 Iran has accumulated large foreign exchange reserve and gold from increased oil prices over recent years. The IMF reported in August 2011 that Iran had $78.9 billion in foreign exchange reserves over 2009-2010 and is expected to reach over $100 billion in 2011-2012. Inflation has also been contained while fiscal and external positions have been improved. It also appears that new international sanctions put in place in 2010 have in practice increased the cost of doing business, limited foreign direct investment (FDI) and technology transfer, and have affected international trade and financial transactions. Additional sanctions imposed by the US and the EU, beyond those called for by the UNSC, pose significant constraints on some international financial transactions, particularly conducted in Euros and US dollars. Although Iran holds large foreign reserves, these transaction constraints will force Iran to find new alternatives to continue to pay for its imports. For example, it could establish yen-based contracts or use gold and oil to obtain products. The United Nations, the United States and the European Union have established mechanisms to monitor the implementation of these sanctions. They focus not only on the oil and gas trade but also on the systems that support these trades. Enforcement of EU sanctions to Iran Subsidiary Legislation 365.32 dated 21st January, 2011 enacts a Sanctions Monitoring Board in order to monitor EU Council Regulation (EU) No 961/2010. It reads “additional restrictions on trade in dual-use goods and technology, as well as equipment which might be used for internal repression, restrictions on trade in key equipment and technology for, and restrictions on investment in the Iranian oil and gas industry, restrictions on transfer of funds to and from Iran, restrictions concerning the Iranian banking sector,…” Monitoring oil trade transactions are done by nations and established monitoring boards. SWIFT has the responsibility for ensuring that individual financial transactions comply with sanction laws; however, responsibility also rests with the financial institutions handling them and competent national and international authorities. So far sanctions have been effective in reducing Iranian oil sales up to 600,000 b/d, however increased oil prices have significantly mitigated Iran’s income loss. As long as the oil prices remain at present prices or below present levels the alliance will be strengthened and more countries will join the US. However, India and China will both benefit from Iran’s situation and offer reduced prices and increased trade with them in order to reduce their own trade deficits. These countries have the capacity to buy all Iranian export oil and they can resolve financial transaction issues between them or receive help from third parties such as Russia. It will be extremely difficult to monitor Iranian borders to stop smuggling and to close loopholes. Although the US has deployed its naval forces to the Persian Gulf region, currently there is no sea blockade or other measures to patrol the Persian Gulf region to stop smugglers. Pressure groups within the country imposing sanctions may oppose their imposition. Burden sharing is a problem – not only among the states imposing the sanctions, but among various interested groups within a participating sanction-imposing state. The impact of the economic crisis is still a burden on European economies and the impact of sanctions will differ from one country to another. In order to keep the level of pressure on Iran, the US will continue to provide waivers to those countries [excluding Iran] on which the sanctions will have the biggest negative impact. In regards to interest groups within the US, Iranian sanctions have limited impact as trade levels are so low already they can be overlooked. However, if the impact of the sanctions lead to an increase in the oil prices, this will create reactions from the interest groups within the country as well as within the wider alliance. The international oil market is a complex and volatile one. The damage of increased oil prices will be felt differently on different sides of the Atlantic as US imports of oil have decreased significantly in recent years. Over the last two decades Iran increased its military capability to disrupt traffic in the Straits of Hormuz. Economic sanctions alone would probably not lead to this scenario. However, Iran has recently threatened to close the Straits and the US has increased its military presence in the Persian Gulf region in order to safeguard oil transit. The Straits of Hormuz is the most important choke point in the world as it provides passage of 18 million barrel day to global markets. Iran may have the capacity to block them for a short period of time which would cause oil prices to skyrocket; while this possibility is limited it cannot be totally ignored. The fourth and the toughest set of sanctions would probably be felt by Iran’s military, the Iranian Revolutionary Guards, and companies linked to them. However, the latest US and EU sanctions have not been approved by the UNSC (with China and Russia voting against them); it therefore depends on unilateral US action supported by its allies to force Iran to comply with UNSC Resolutions. In a March 2012 ABC News/Washington Post poll, 84% of the American public believes that Iran is trying to develop nuclear weapons and 74% are in support of the economic sanctions. Although they supported direct diplomatic talks (81%) to resolve the situation in order to prevent Iran from developing these weapons, they opposed bombing of Iran’s nuclear development sites. There is the possibility that economic sanctions may harden the attitude of the target state. The political leader of the target state, in this case Mahmoud Ahmadinejad, could excite nationalistic sentiment in Iran by stigmatizing the sanctions as a humiliating affront to the nation, and thereby promote national unity in the face of outside pressure. Iran has been subject to sanctions for almost two decades and there is already a strong nationalistic sentiment developed against West. This sentiment has also been supported on religious grounds as the Supreme Leader Ayatollah Ali Khamenei supports development of the nuclear program. The Iranian leadership has been further trying to establish a network with Iran’s trade partners. Iranian President Mahmoud Ahmadinejad has visited Russia, China, India, and Venezuela all within the last year. The Iranian oil embargo is an important step, within the context of general sanctions, and it has been strengthened by a freeze on Iranian financial sanctions and assets. Do the US and its Allies’ believe sanctions on Iran can work? To what extent is the oil embargo effective? Several key variables affect the answer to these questions. First and foremost, the answer is not black and white (failure or success). While US economic measures will not force Iran to stop its development of a nuclear capability, whether it is for peaceful or military purposes, sanctions will bring Iran to the table for negotiations over International Atomic Energy Agency oversight. The oil embargo and associated financial sanctions will make a difference and force Iran to continue with the P5+1 negotiation. The key element for Iranian non-proliferation is that Tehran stop uranium enrichment and allow a mechanism to monitor and to follow the 2008 P5+1 proposal. The second key finding is the high value Iran gives to its nuclear program in order to obtain a dominant position in the Persian Gulf region. This has to be understood within a geopolitical and historical context. The West argues that Iran is developing a nuclear weapon; Iran suggests that it plans to continue uranium enrichment for peaceful purposes. As the US helped Iran to get rid of its historical enemy Saddam Hussein, and a friendly regime is now in charge in Iraq, the time is right in Iran for such a move. Joining the nuclear club would enable Iran to assert its position across the Arab region. The US Administration would like to express its determination that Iran will not be allowed to develop a nuclear weapon and to assure its public and Israel. Any Israeli unilateral action against Iran, using military force, would damage the alliance established to enforce the sanctions and would subsequently destabilize the entire region. This would have a negative impact on energy, in particular oil prices, which have already been volatile due to increased demand, recent changes in the Middle East, and increased tensions in the Persian Gulf. A final observation is the importance of keeping the alliance intact to achieve maximum effect on Iran. In order to get the desired effect from sanctions, it is important that most of its current customers follow the US request to reduce their oil imports from Iran. In order to achieve this solidarity, the US and other petroleum producing countries in particular, Saudi Arabia, Libya and Iraq should increase their oil production. The US and other IEA countries should also be ready to release their Strategic Petroleum Reserves. Additionally, India, China, Turkey and South Korea have to be convinced that these sanctions are not against them, but for the benefit of all to avoid a future crisis in the Middle East. The final point is oil’s role as a strategic commodity. Oil has been used as a strategic weapon and oil and gas will continue to be used as foreign policy tools in the future. This may create sensitivity in those countries which have had an exponential increase in demand in recent years. As the US is expected to continue to decrease foreign oil imports in coming years, the increased US role in the Persian Gulf area will create distrust on those countries heavily reliant on oil imports from the Middle East such as India and China. Finally, although the sanctions are going to harden Iran’s positions, they may create a separation between the President and the Supreme Leader. Because President Ahmadinejad has openly challenged the supreme leader, Ayatollah Ali Khamenei in recent elections Ali Khamenei has been able to obtain more conservative seats in Iranian parliament (majlis). Also, their approach towards International Atomic Energy Agency inspections has been reportedly different. Contributor Mehmet Kinaci is strategic analyst at Allied Command Transformation (ACT). The views expressed in this article are the author’s only, and do not necessarily reflect those of the ACT or the North Atlantic Treaty Organization.